The Superbowl commercials are not the only thing I look forward to on Superbowl Sunday; I love the food! My parents are amazing cooks and the food is one of the main reasons I love going over to their house (besides visiting!). However, now that we have moved away from home and started our own family, we also get to start our on traditions; including hosting parties with some amazing food. One of the main staples I try to provide party wise, are foods that I know my children will eat. Who wants to be forced to go to a party only to not have food there you can eat or like? I sure don’t and I know my kids wouldn’t appreciate a party in their own home without some of their favorites to munch on. My guess, like in our home, your home has a conglomerate of family members with different taste pallets. We have the “cheese only” person, the “pepperoni only” person, the “everything” person and the “anything” person. It gets very complicated around dinner time when trying to place a pizza order and forget getting a frozen pizza, we would need about 4 to please everyone. Then one fine day, Hubs had an idea. It was a brilliant idea; and idea that please everyone. We only buy cheese pizzas at the store. GASP! I did not like this idea at first. I am the “everything” person, so cheese only was a sin. However, he explained and it was one of those “duhh” moments. I’m sure you have now realized what his brilliant idea was. If you haven’t yet, don’t sweat it; it took me a few minutes to catch on. His brilliant idea? Buy cheese pizzas then add toppings. <smacks forehead>. Seriously? Its that simple? Yes…yes it is. We always have pepperoni on hand (Bug’s favorite sandwich for school lunch) and since I love my dirty martinis, we tend to have a jar of Kalamata olives missing some juice in the fridge as well. So this Superbowl Sunday save yourself some stress and buy a few cheese pizzas from the freezer section and some toppings. You can even set up a pizza bar and let every one make their own half of a pizza. 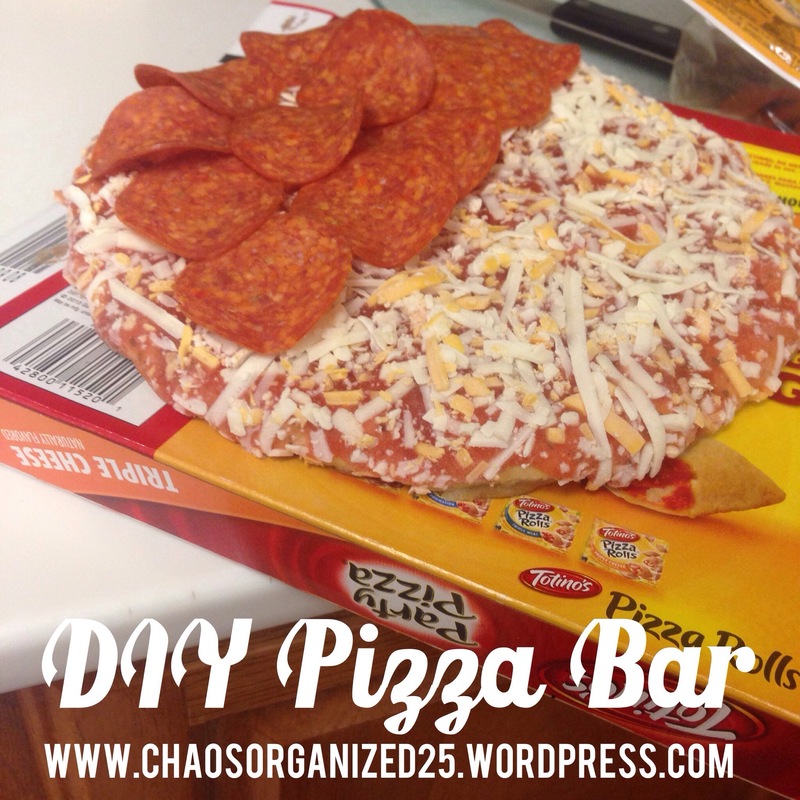 This entry was posted in Foodie Fridays and tagged DIY, food, foodie, foodie friday, Friday, Pizza, pizza bar, Recipe. Bookmark the permalink.